I’m very lucky to have some good friends in Cumbria who have excellent knowledge of the trails of the Lake District, however the downside of this blessing is that I rarely end up exploring there for myself. 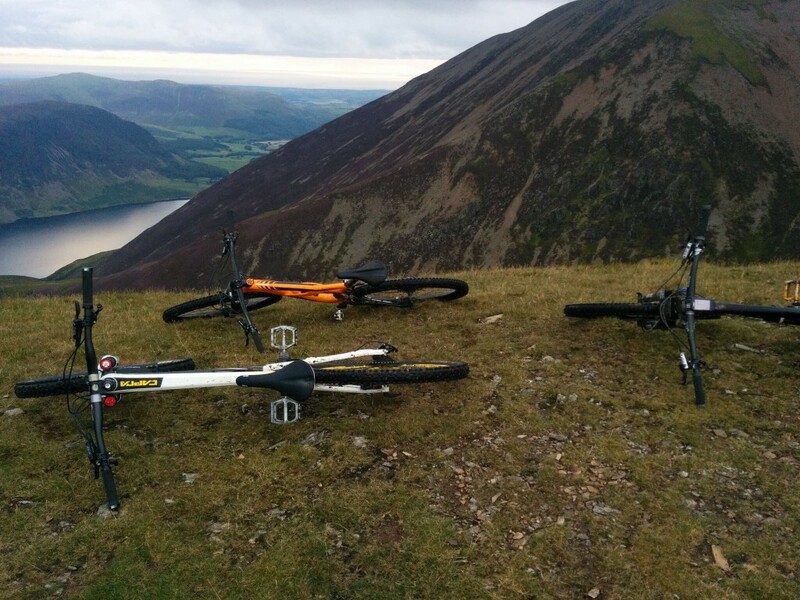 But I did have the chance to strike out on my own a bit this week, because I had half day off work and had arranged to meet some pals at 6pm for a ride from Buttermere – giving me a few hours to kill with a solo excursion beforehand. 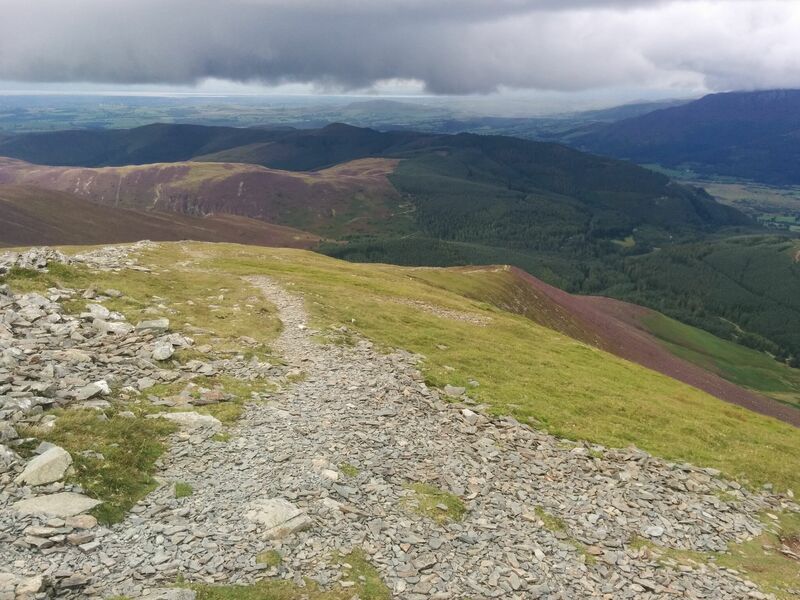 I opted to try something new to me, heading up Grisedale Pike from Whinlatter, since it was on the way and looked like it’d take less than two hours and be easy to navigate. I’d researched the route using Strava and grabbed a suitable GPX file for my Garmin, which took me out of the car park at Whinlatter’s trail centre and up to the top of the south loop. Doesn’t look too bad from this angle does it? This was a pleasant climb as the sun occasionally peeped out from the overcast late summer / early autumn sky – and the exit point from the south loop was easy to find, with plenty of tyre tracks leading off at a right angle from the hard surface into the slop and through the trees. 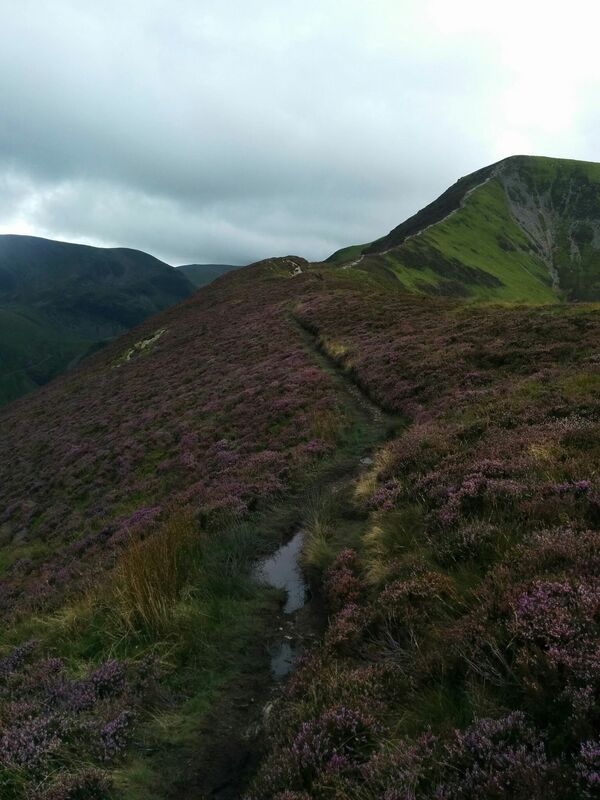 A brief push followed by a hop over a fence put me out on the open hillside with Grisedale Pike in front of me – and the ridge path visible all the way up to its 791m peak. I started off pedaling but as things began to get steeper I had to dismount and push, before a more rugged section prompted me to hoist my bike over my head to make the going easier. A pair of walkers seemed genuinely astonished to see me carrying a bike. They asked me to confirm that I was actually heading up to the summit, which I did and reassured them I was descending a different way – thinking to myself that it had better be a bit less steep. More hike-a-bike and pushing brought me to a much steeper and rockier section, which required a bit of scrambling – using one arm to steady myself on the rocks as I balanced the bike with the other. This was bloody hard work and I had to reward myself with the odd breather every so often, leaning my chest against a handy rock at one point while I gathered my resources. You can see the tricky scramble a bit further up the hill here. At this point I met another hiker coming downhill, a German lady I think, who answered my cheerful hello with a fearful look on her face. Hopefully she was nervous of the steep descent rather than me! I asked her to reassure me that I was nearly at the top and she obliged and smiled, as the gradient began to slacken and a path re-emerged from the jutting rocks, with the summit now visible a short distance away. Lugging the bike all the way to the summit, I set off down the obvious trail running down the adjacent ridge – which was steep but easy and to be honest a little bit disappointing. The route had pointed in the right direction and been totally obvious from the top, so I was surprised to hear my Garmin beep to warn me that I’d gone off track. Checking the map, it appeared that I should have set off down the grassy hillside a little further to the left. The path down seems obvious doesn’t it? Except it was the wrong one. Pushing uphill to regain the trail on the tussocky grass wasn’t that much fun, but it was a lot easier than the previous scramble – so I didn’t complain – and I quickly found the correct route on a less clearly defined ridge. Grass gave way to singletrack, with occasional rocky outcrops and steep chutes thrown in – demanding a bit of commitment. I’m not afraid to admit that I walked a couple of the more awkward features, feeling a bit tight as it was the first descent of the day. I couldn’t let go of the brakes as much as I’d have liked either, worrying about high-siding in one of the many ruts. 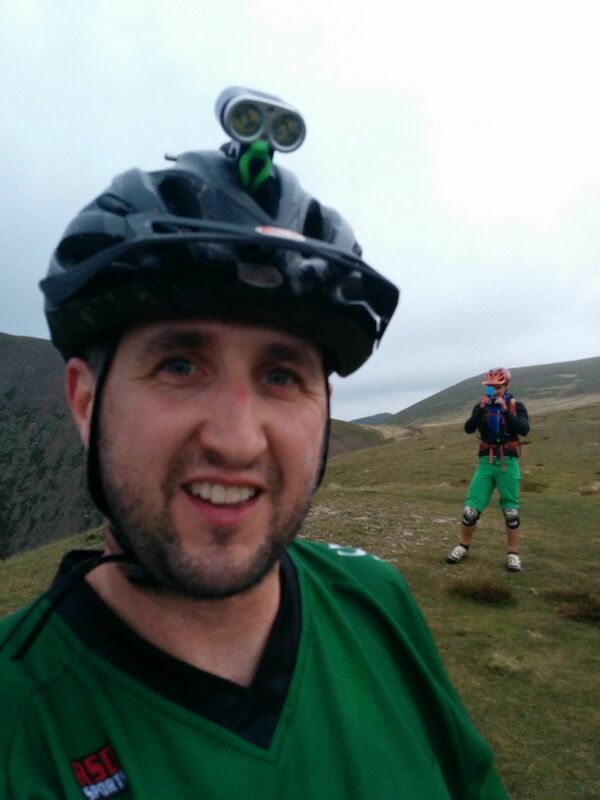 The descent was fun though and seemed to go on for a good distance before I reached the woods at Hobcarton – where the trail dived straight into one of the Whinlatter enduro race stages. Greasy conditions and an array of slippy roots again prevented me from going flat out, but this was a fun track with the perfect amount of gradient to keep the bike moving without braking too much and enough line choice to make things interesting. All too soon I was back at the bottom of the south loop – and decided I had enough to time to ride part of the trail centre as well. Sadly I was too short of time to go all the way to the top, but took the escape route halfway up the south loop and had a fun blast back down to the car park on the well-designed man-made trail. Switching the Garmin off I could see I’d climbed 720m over 13km, but I felt like I’d just started warming up and was confident I wouldn’t suffer too much on the next ride. A swift (actually it was quite slow) drive round in the van and I was bang on time, but found Chris, Adam and Bish had turned up early and were mucking about on each others’ bikes in the car park. Soon we were all pedaling up the first bit of track, me feeling reasonably happy with my legs and with the new 1×10 set-up on my bike – which I’d been concerned might leave me struggling in these big hills. 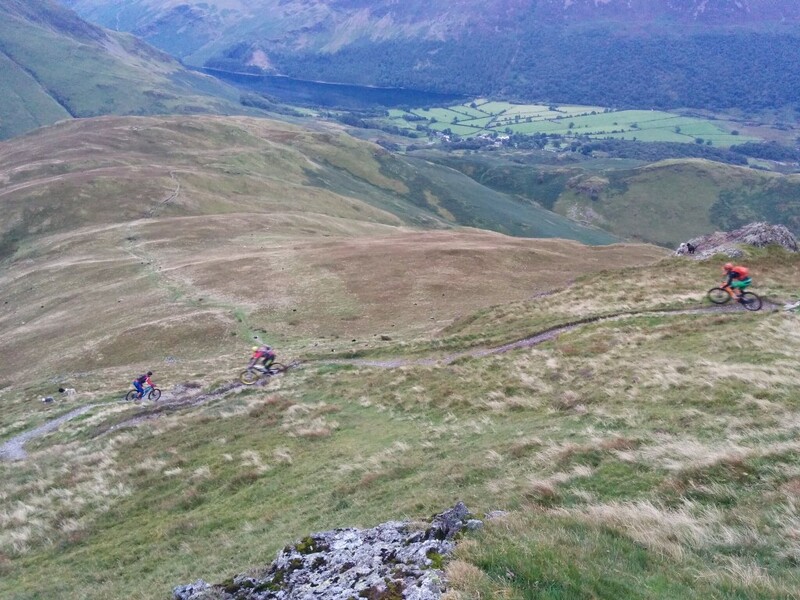 That wasn’t an issue after a few minutes anyway, as we were all off and pushing up the steep grassy track beside Coledale Hause – which then turned into a steep rocky track. I was starting to feel it in my legs now and my bike was becoming a bit of a (literal) pain in the neck, with a sore patch developing where I’d balanced the downtube – but I dug deep and didn’t fall too far behind the others. About halfway up the climb the gradient let off enough to allow us a welcome pedal, but my easiest gear wasn’t quite easy enough on the loose surface and I made a mental note to fit the 40t expander cog I have in my spares drawer. Anyway, long story short we all made it to the pass beneath Grasmoor in one piece and it didn’t take long at all from there (via a short-but-sweet descent and brief climb) to Whiteless Pike itself – where we stopped to refuel and take some photos before the main descent. Taking a breather at the top of Whiteless Pike. Me getting papped by Adam as I take a selfie. The ride was a new one to me, but I’d seen some promising-looking photos on Facebook. All of the others had ridden it before and there was scepticism about Chris’ description of there being “just a little technical bit”. The first part of the descent was lovely – with a rocky trail featuring some nice turns and a choice of lines when the trail occasionally gave way to grass studded with rocks of various sizes. I decided that discretion was the better part of valour on a tricky, off-camber rocky outcrop located on a switchback turn – but was relieved to see I wasn’t the only one to wuss out. It was one of those features that I could imagine riding in theory, but finding an actual line I could commit to was more difficult. Adam and Bish head downhill. Chris on point with Bish and Adam behind. More rocky fun followed until we reached “The Slab”, a much bigger rocky outcrop which served as a transition between higher and lower parts of the trail. After seeing Bish career down this with a leg out, barely in control and swearing involuntarily, Adam and myself felt no shame as we both opted to walk it. More top-notch trail followed before we regrouped and admired an epic sunset, with a very pleasant view across the Solway Firth to Dumfries and Galloway. 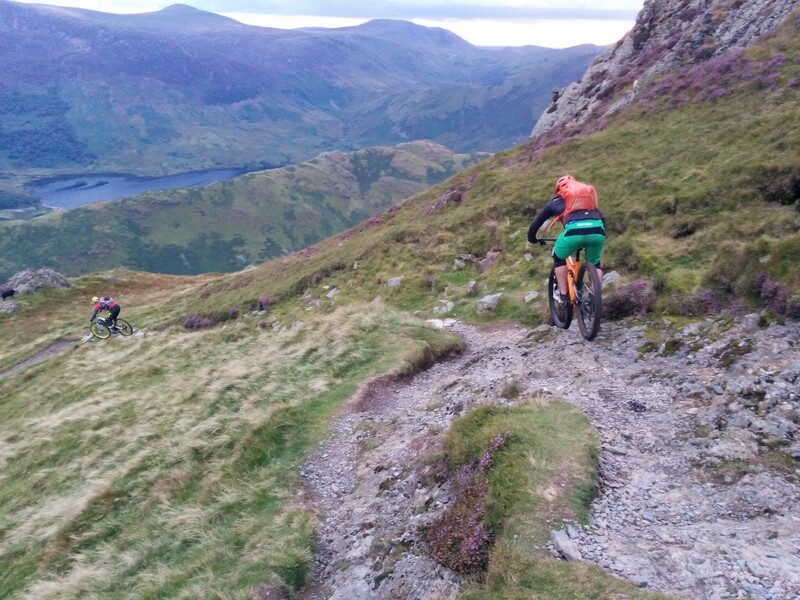 High mountain trails gave way to less steep but faster singletrack now and the descent down through Rannerdale. Chasing one another down through the long shadows in the gloriously green and quiet valley was probably the best bit of the ride, and even losing half the air from my rear tyre when it holed and sealed up didn’t bother me. It wasn’t a bad spot to stop and pump a tyre up. We’d timed it just right and darkness was falling as we reached the road and it was dusk by the time we’d made it back to the vans. 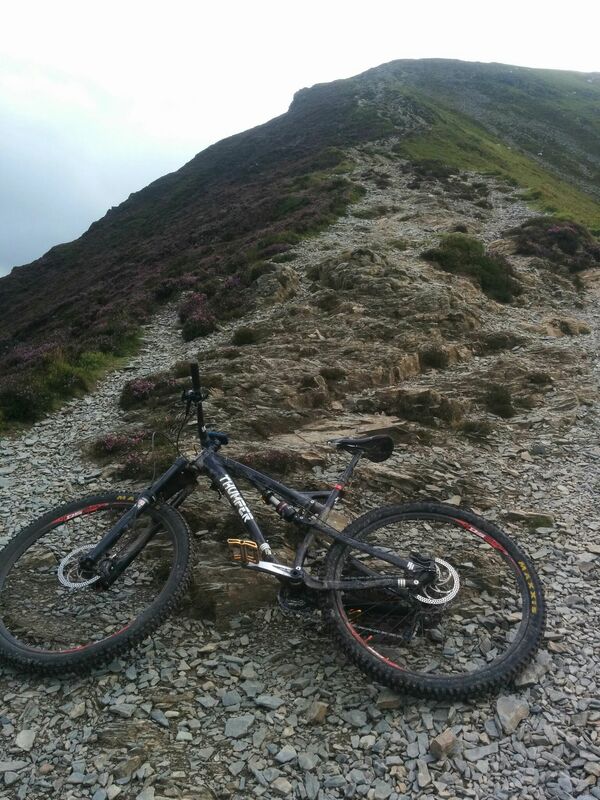 The total ascent was remarkably close to the last ride – 709m this time – but while it might have been 11m lower, Whiteless Pike was the clear winner in terms of quality trails. I reckon I need to take more half days like this. 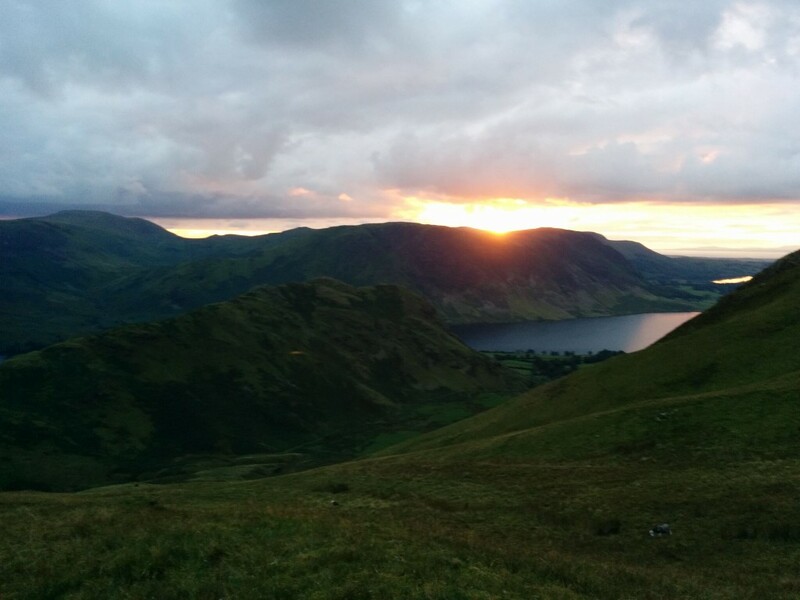 The glorious sunset over Rannerdale was a lovely surprise. Quality days riding mate. Very jealous.